*I Received a Dollar General Prize back with gift card in exchange for my post. All opinions expressed are my own. I feel so blessed to live in America. No matter what type of crisis or obstacle that comes our way we all seem to band together to get through it. Our freedom comes at a price though, all of those brave men and women who give their lives everyday on the battle field to make sure we can stay in this beautiful country. 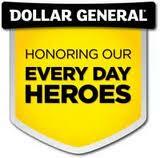 To celebrate and honor military service, Dollar General has chosen Sparky Edwards as its Every Day Hero for June 2013. Sparky exemplifies the Every Day Hero. He is a retired, decorated military veteran who served in South Korea and in Iraq. Once an at-risk teenager, Sparky turned his life around with the help of a National Guard youth academy. The fresh start helped him earn his GED and enter the military. Today he is a successful business owner, pursuing his PhD and paying it forward by volunteering to mentor at-risk teenagers. Dollar General is a great place to shop because not only do they have great prices but you can also pair coupons from your local paper to stretch those bucks even further. Be sure to pick up your local paper on June 2nd where you will find the June P&G brandSaver! These are my favorite coupons because they are normally really high value and are a great way to save money. To enter this giveaway follow the instructions below using Rafflecopter! Good Luck. My husband-he does a lot since I am broken and cna’t move around a lot-he clenas, cooks, takes care of us. He’s a vet and serves in Iraq. He is kind and understanding. And he is SO handsome too! My Everyday Heroes are the police officers, fire fighters, hospital workers, and those in the military who work to keep us safe, healthy, and free! my sisters are my everyday heroes. myeveryday hero is my parents, they are wonderful! My boyfriend is my everyday hero! My husband because he goes all out for anybody he can help! My every day hero is my husband. His patience and love are so bountiful, and he is a real blessing in my life! My everyday heroes are the security guards that put their lives on the line at our local stores, hospitals, and more – all of too little pay. My kids are my heros.